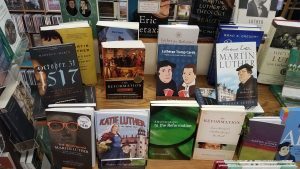 Many central Pennsylvania Hearts & Minds customers have noted our big display of books about Martin Luther and the Protestant Reformation, the world-changing movement that rocked the church and world starting, symbolically, at least, on October 31, 1517 – 500 years ago. That we need to commemorate this huge historic occasion — 500 years! — goes without saying. For everyone in our Western culture, but especially those of us in the Protestant wing of the church, this really is a huge deal. And if you are Lutheran, Presbyterian or Reformed, well, let’s get out the party hats. It is a hard thing, though: Luther and Zwingli and Calvin and most of the earliest reformers didn’t imagine starting a new non-catholic church; they were reformers, after all, not revolutionaries. So there is much to lament about the subsequent brokenness of the one Body of Christ. We agree with the major Lutheran assemblies who have said that while we should commemorate this extraordinary era and use the Luther anniversary as an opportunity to revisit the major theological and spiritual matters that galvanized the Protestant movement, we don’t exactly want to use the language of “celebration.” Any renting of the global Body of Christ is a bad thing, even if, as most Protestants attest, it was a necessary thing. We are doing a little class on the Protestant Reformation in my local church and so I’m extra-motivated to find just the right books to promote that can help rekindle a love of learning – itself a reformation theme — and motivate us to think deeply about reformation doctrine. Here are two lists: twelve great introductory books for those that want a basic and enjoyable primer to these tumultuous times and a second list of more scholarly or serious books. If you haven’t read anything about this stuff (or haven’t in a while) I implore you to reflect on these recommendations and see if any captures your attention or seems like they might be helpful for you or yours. And help us spread the word, please. I don’t know if your local bookstore is curating a list like this, but we need your support in finding customers who care. Like the Protestant reformation movement itself, we need to use social media (you know how Luther used the new technologies of the printing press) and a bit of ground-level marketing to get the word out. Can you share this with your pastor, Christian educator, fellowship leader, campus minister, or Bible study teacher? Thanks. 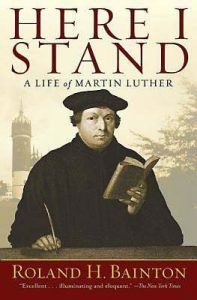 Here I Stand: A Life of Martin Luther Roland Bainton (Abingdon) $19.99 This small biography written decades ago is still considered a classic stand-out, just a really engaging read. Highly recommended even if a bit dated, now… there is another edition, but I suggest this one as the print is just a bit better. 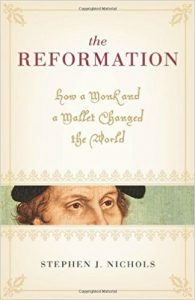 The Reformation: How a Monk and a Mallet Changed the World Stephen Nichols (Crossway) $14.99 I like Steve Nichols so much — he is now with RC Sproul in Florida but he used to teach near us at Lancaster Bible College. (And, besides a bunch of popular level books, he’s got a marvelous book on the blues, so he’s my kind of theologian.) Professor Nichols is a very dynamic teacher, a lively theologian, a great writer, able to take mature, complex scholarship and make it quite relevant and readable for ordinary folks. This is a fun “behind the scenes” look which uncovers some of the dynamics behind this era, and behind the stories of the Reformation. …Monk and Mallet… is a fantastic, readable and inspiring book, very nicely done — history comes alive in about 180 pages. There are some interesting plates and pictures, too; highly recommended. 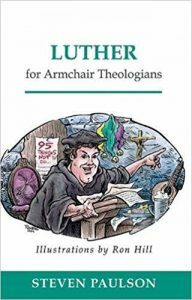 Luther for Armchair Theologians Steven Paulson (Westminster/John Knox) $18.00 I love this series of upbeat and witty books that offer solid introductions of various theological voices from the past, complete with goofy cartoons offer some helpful illustration and insight. In this case, Paulson is a professor of Systematic Theology at Luther Seminary in St. Paul, Minnesota, so is ideally suited for this daunting task. How to explain Luther – his life and his thinking and his legacy – in one sprightly volume? Paulson pulls it off. Despite the cartoony covers, these “Armchair” books are not silly, (and the series includes good introductions to everybody from Augustine and Aquinas to Calvin and Knox from Wesley and Edwards to Bonhoeffer and Martin Luther King, and more. There is even one on Heretics for Armchair Theologians which is a layperson’s study of the classic heresies of the earliest days of the church. Anyway, check out Luther for Armchair Theologians. Here is one interesting and slightly confusing marketing matter: some of these clever books, each with often insightful cartoons, are being reissued without the illustrations, with much more sober covers, and standard if rather uninspiring titles. 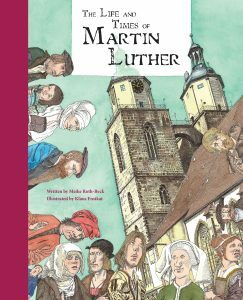 For instance, this exact same book is available sans cartoons and creative title, as A Brief Introduction to Martin Luther. It is $20.00. Choose your format. 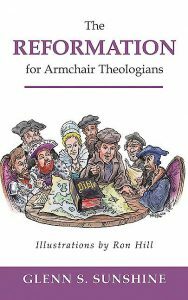 The Reformation for Armchair Theologians Glenn S. Sunshine (Westminster/John Knox) $18.00 This one is also a part of that series which takes serious theologians and makes them accessible to ordinary folks. Again, there are some whimsical cartoons and there’s some wit about them. This one looks at all the key players and the various places where the Reformers worked during this tumultuous time and I really learned a lot. I need this kind of clear but interesting resource so I highly recommend it. In fact, I taught a class on the Reformation at my own church a few years back among folks that admitted to not knowing much about this time period (and who didn’t have the time or energy to dig deep into serious books) so I used this as a primary source. Glenn Sunshine is a good, reliable scholar and the book is clear and even inspiring. 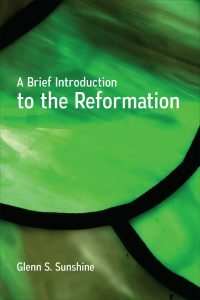 Timothy George of Beeson Divinity School calls it “scintillating” and “a solid primer.” There are lots of facts, fine interpretations, with a good, easy to read chapter on each key topic or region where Reformation teaching broke out. It makes the over-all narrative come alive. Again, too, The Reformation for Armchair Theologians is now also available with a different look, no cartoons, and a less goofy cover under the title A Brief Introduction to the Reformation. It sells for $20.00. Choose your edition – same book, different look. 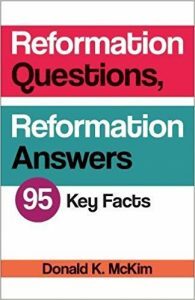 Reformation Questions, Reformation Answers: 95 Key Events, People & Issues Donald McKim (Westminster/John Knox) $15.00 In my own PC(USA) denomination, Dr. McKim is a beloved teacher and author who has done resources such as Presbyterian Questions, Presbyterian Answers which are very interesting and helpful Q&A books. This one is formatted the same, with a page or so on a whole bunch of common questions. The first part includes lots of stuff about history (from questions about the historical background such as “What Is the Reformation?” “How Did the Reformation Develop?” “What does Protestant mean?”) to questions and answers about events, people, and places. There’s so much clear, simple information here that it is a great resource to have on hand even if you are well-schooled. Following that portion there are more sections under the general headline of the theology of the Reformation; his explanations are clear and not overly fiery or polemical. 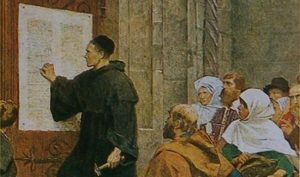 A final unit of questions offers answers about the legacy of the Reformation. This small book is easy-to-read and interesting from a fine and respected mainline denominational church historian. McKim’s latest book, by the way, is Moments with Martin Luther: 95 Daily Devotions. Luther on the Christian Life: Cross and Freedom Carl Trueman (Crossway) $17.99 This thoughtful work is in a series of books called “Theologians on the Christian Life” on the likes of Calvin, Wesley, Jonathan Edwards, Bavinck, Bonhoeffer, and Francis Schaeffer, that are less designed to be full historical biographies (although each does offer a great overview of the life and times of each theologian) but more to take the thinker’s key ideas and apply them to our spiritual lives today. In this case, it’s Luther’s view of freedom in Christ that is aptly explored by this strong professor from Westminster Theological Seminary. Any study of the Reformation has to start with Luther, of course, and although this has the orientation about how Luther’s idea on freedom can inform your own faith, it still is a good biography. In fact, this is a great way to read biography as it makes the connections clearly about how to live into his best ideas. If you saw excellent PBS documentary on Luther that has been airing this season, you will recall hearing Dr. Trueman, the one with a British accent. He’s remarkable. (By the way, I especially love the one in this series called Bonhoeffer on the Christian Life: From the Cross, for the World written by former Lancaster Bible College prof Steve Nichols, who I mentioned above [Crossway; $19.99.]) Impressive. Martin Luther: The Man Who Rediscovered God and Changed the World Eric Metaxas (Viking) $30.00 I wish I had more time to review this – well, what I really mean is I wish I had more time to read this 800 page tome – as I suspect it is the most engaging and compulsively readable of the major biographies of Luther ever written. I need to say that while I disagree with most of Metaxas’s recent politics and readily admit he is a popularizer (not a precise, scholarly historian of the top order) his books are marvelously written, insightful, and to be happily celebrated for the great good they do in introducing curious folks to good, good stuff. Not all will agree but I think they should try to overcome their bias and enjoy his fabulously interesting prose and obviously sincere dedication to the work. 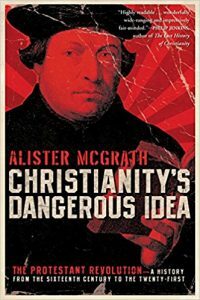 (You know Metaxas did a ground-breaking and excellent biography of William Wilberforce called Amazing Grace and then did that massive, exceptionally popular, if a bit controversial, biography of Dietrich Bonhoeffer.) Here he has put his considerable wit, eye for detail, and insight about the big historical and spiritual picture to work explaining the life of this seminal, provocative, fascinating man the Pope called “a wild boar.” This big book is very engaging, loaded with great information, and I am glad to recommend it. There are some lovely full-color plates and a fascinating appendix you really should know about. 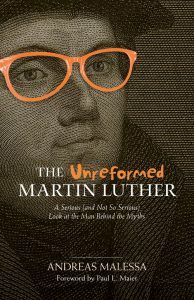 The Un-reformed Martin Luther: A Serious (and Not So Serious) Look at the Man Behind the Myths Andreas Malessa with a foreword by Paul Maier (Kregel) $14.99 Andreas Malessa, besides being a theologian, is a lyricist (most recently for the play Amazing Grace.) Luther would like him I’m sure. Here he attempts to “set the record straight” about varying myths and misunderstandings. It’s a well-known approach – setting forth the common confusion and clarifying it with a good, solid chapter but as you can tell from the cover he does it with wit and verve. I can’t weigh in on whether this really allows “the real Martin Luther to please stand up” (as the old game show put it.) But at least, it is lively and entertaining. 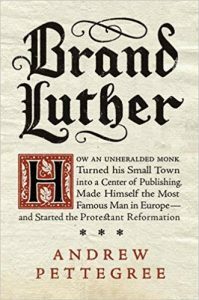 Not many books on world-renowned theologians like Luther are written “gleefully” as this one promises to be, so I wanted to list it here. Looks great. 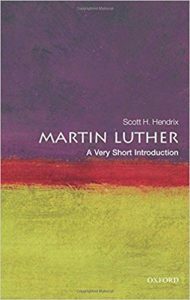 Martin Luther: A Very Short Introduction Scott H. Hendrix (Oxford University Pres) $11.99 Do you know these pocket-sized “Very Short Introduction” books? We have them on all kinds of topics (the ones on spirituality, on theology, on various Bible topics, on Calvin, not to mention many on scientific topics and political history are all very, very good.) There are hundreds of them, actually. Oxford selects a world-class scholar in the field to give us the very shortest introduction in a compact book the size of a pocket Testament. Dr. Hendrix is Professor Emeritus of Reformation History at Princeton Theological Seminary and is active in many professional associations pertaining to Luther studies. 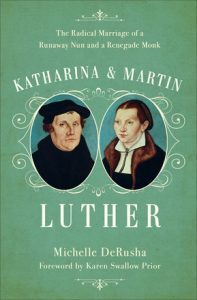 Katharina & Martin Luther: The Radical Marriage of a Runaway Nun and a Renegade Monk Michelle DeRusha (Baker) $19.99 I hope you get to read something about the famous Katie Luther; she is important and fascinating. We even have a comic book version for children about this marvelous and important reformation leader. This recent book by the young, upbeat writer Michelle DeRusha explores Katie’s role and, particularly, the often-discussed marriage of the two. What a radical gesture for this ex-monk and ex-nun to marry in those times! There is a lovely and well-written foreword by Karen Swallow Prior that will make you want to dive right in to this moving love story. By the way, although I haven’t read it yet, we really appreciate the fine biographies and historical writing of Ruth A. Tucker. 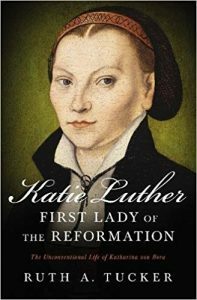 Tucker has just released Katie Luther, First Lady of the Reformation: The Unconventional Life of Katharina Von Bora (Zondervan; $17.99) and it surely should be on any list we’re making. It will show that Katie Luther was a strong woman, a modern “equal partner” in the big work of the Luther household. Check it out. 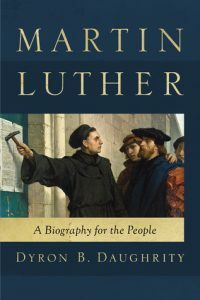 Martin Luther: A Biography for the People Dyron B. Caughrity (Abilene Christian University Press) $19.99 I love that this is designed to be a readable introduction by way of a lively but substantive biography for “the people.” Luther would like that. Martin Luther: A Biography for… is a “fresh retelling” for ordinary readers. Scholars such as Philip Jenkins say the author “deserves all praise for this readable and reader-friendly account.” Others have called it “riveting” and “exciting yet scholarly.” It is supposed to be one of those rare books that “makes good scholarship into a good read.” Yay. By the way, we stock a book of his called Roots: Uncovering Why We Do What We Do in Church which looks really good. 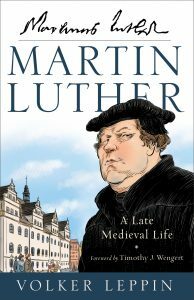 Martin Luther: A Late Medieval Life Volker Leppin, with a foreword by Timothy J. Wengert (Baker Academic) $22.99 This is a slim but eloquent hardback book, wonderfully translated (or so I’m told) by a marvelous, respected theologian from the University of Tubingen. He is widely regarded as the leading German historian of this time period and has served as the “scientific director” of the Ecumenical Working Group of Protestant and Catholic Theologians. He is known and respected world wide so we were grateful to get this very new release. The rave reviews have been robust and by all accounts this is a beautifully crafted, authoritative (if brief) biography that adds some new insights into this grand story. I’m eager to read it and anyone interested in this topic will surely be glad to have it. 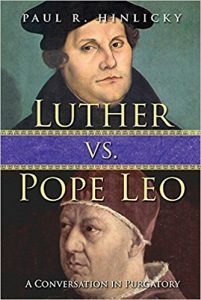 Luther Vs. Pope Leo: A Conversation in Purgatory Paul Hinlicky (Abingdon Press) $19.99 Oh my, does this look delicious! Even the subtitle – alluding to a conversation in Purgatory, which is part of what Luther’s protest on October 31st 1517 was about, after all – is brilliant. This is the third in a series this publisher has done imagining conversational debates between two standoff figures from church history, such as the one they did called Calvin Vs. Wesley penned by Don Thorsen. And, yes, obviously, it is an imaginative conversation between these two intellectual giants. But what a creative thought experiment it is! What a way to appreciate more fully the nature of the sixteenth century debates and the very meaning of the gospel for our lives today. Hinlicky is the Professor of Lutheran Studies at Roanoke College in Virginia and not only a Reformation-era scholar, but, like the Reformers themselves, is a scholar of patristic theology and the early church. 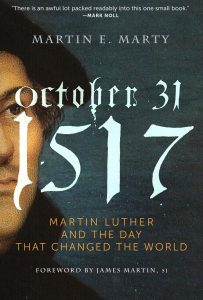 October 31 1517: Martin Luther and the Day That Changed the World Martin Marty (Paraclete) $19.99 Well, this is one you can probably read in almost one sitting, by one of the great Lutheran leaders and respected church historians of our time. There is a very nice forward by Father James Martin, a Jesuit, which I think is kinda fun and funny. (Not to mention that the Lutheran’s name is Martin, the Catholic’s name is Martin and it is about the thinking of one monk named Martin.) It’s a splendidly designed hand-sized hardback, a short rumination on the call of that key day – the first of the 95 Theses is about repentance – if less about exactly what happened that day. Not as much history, here, actually, as you might expect and more of an extended reflection. Rave reviews on the back are from former Fuller President Richard Mouw, Rev. John O’Malley, a Jesuit from Georgetown University, and Protestant contemplative Kathleen Norris. Nice. 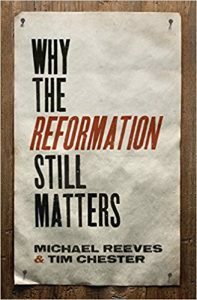 Why the Reformation Still Matters Michael Reeves & Tim Chester (Crossway) $16.99 I haven’t read this little one yet as it just came out a few months ago. It is written by a respected, conservative, evangelical and it seems truly to be about “why it matters today” (particularly to evangelicals.) I’m sure he is stern about Luther being right to reject Catholic dogma and insists that the 11 things he says the Reformation stood for are in fact things that we need to clarify and affirm again today. By the way, I read an earlier book by Michael Reeves called Delighting in the Trinity which was tremendous! He has a bigger reformation volume that is highly regarded which offers be more of the standard historical overview; it is called The Unquenchable Flame (Broadman & Holman; $14.99) which looks fine, serious but not overwhelming or excessively detailed. Mark Dever wrote the foreword to that one. Both of these look very useful. 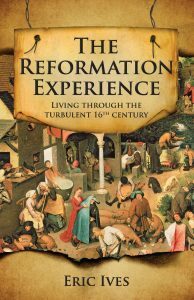 The Reformation Experience: Living Through the Turbulent 16th Century Eric Ives (Lion Press) $16.95 I haven’t read this yet myself, but Ives is an expert on the Tudor period and here he gives us a “down to Earth” street level view of life in England during the era of the Reformation. What did common people do and experience? How did the new teaching of the Reformers affect them, their views and their beliefs and their behavior? This book is a bit different, not only because it looks mostly at British history but because it is less about the “great figures” (Luther, Melanchthon, Calvin, Cranmer, Bucer, etc.) and more about the common people. One of our customers who is well read in this whole field reported back how very much he loved it. 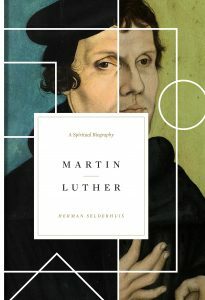 Martin Luther: A Spiritual Biography Herman Selderhuis (Crossway) $30.00 Some may know the Dutch theologian and professor Herman Selderhuis for his important biography of John Calvin or his work as Director of Refo500, an international platform proclaiming the value of the Protestant Reformation. This work is brand new, a handsome hardback, which I almost listed in the “introductory” list, as it comes with rave reviews for being so enjoyable and approachable. “This is how a biography should be written,” says one. “He writes with an enviable, conversational ease,” declares another. Peter Lillback, professor of historical theology at Westminster West says “Don’t miss reading this fascinating, fun, poignant foray into the spiritual life and tumultuous times of the one who, as Calvin described, ‘gave the gospel back to us.’” Even the esteemed Volker Leppin has an endorsement. Brand Luther Andrew Pettegree (Penguin) $18.00 We raved about this when it first came out in hardback a year or so ago and have been telling folks about it now that it is a more affordable paperback. 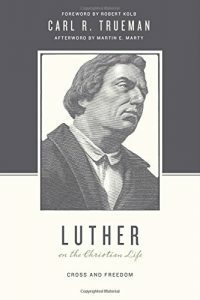 Here is what it properly says on the cover, in Gutenburg-esque font: “How an Unheralded Monk Turned His Small Town into a Center of Publishing, Made Himself the Most Famous Man in Europe – and Started the Protestant Reformation.” Brand Luther is so interesting as it extols Luther not just for being a revitalizing theological voice or church reformer but as the first to exploit the new technologies of printing, advertising, and marketing. He was the world’s first master of mass communications. Wow. 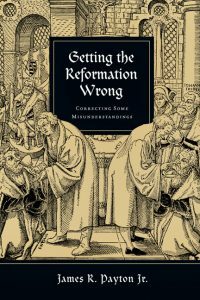 Getting the Reformation Wrong: Correcting Some Misunderstandings James Payton (IVP Academic) $23.00 Many say this is tremendous, and one reviewer said it is one to start with. Professor Payton teaches history with Al Wolters and other remarkable folks at Redeemer University College in Ancaster, Ontario. It is fairly heady, but seems to be an important, historical one, naming some of the worst misunderstandings and confusions about the era. Just in my own reading these last weeks in preparation for my adult ed class at church, I’ve had to double-check all kinds of things that seem to be only partly true, at best. This book fills a real need, I think. Getting the Reformation Wrong gets the Reformation right. All students of the Reformation, whether academic or just interested, must read this book. It rightly sets the record straight about the great people and ideas of the Protestant and Catholic Reformations of the sixteenth century in a refreshingly engaging style. Christianity’s Dangerous Idea: The Protestant Revolution — A History from the Sixteenth Century to the Twenty-first Alistair McGrath (HarperOne) $15.99 I wanted to mention this because it does offer very good insights into the 16th century but is also just a great overview of the social, political, theological and cultural implications and legacy of the “revolution” that that Reformation began. This is a pretty fresh interpretation; it seems, unique and really interesting. 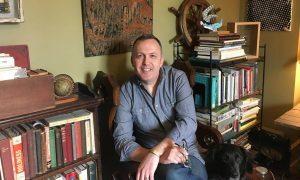 You may know McGrath, who holds both a theological PhD and one in science as well. He is theologically solid, brilliant, and a fine writer. Cool “revolutionary” cover, too, eh? The Reformation: A History Diarmaid MacCulloch (Viking) $25.00 This really is magisterial, considered not only one of the best books of the Reformation era, but one of the very best books of history produced in recent years. It has won some prestigious awards (including the coveted National Book Award) and is quite hefty (865 pages.) This is truly stellar work, following on the heels of his previous major work on the first half of church history. It is highly recommended by folks from various quarters – from within the academic world and among theological scholars. 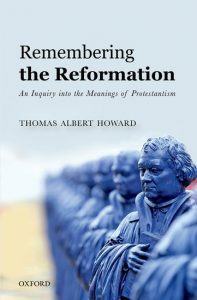 Remembering the Reformation: An Inquiry Into the Meanings of Protestantism Thomas Albert Howard (Oxford University Press) $40.00 This is a slim book, overpriced, I’d say, even if published by the prestigious Oxford University Press. Still, it is, as Philip Jenkins writes, “a thoughtful and rewarding book. At one level, it tells the story of how successive generations have recast that pivotal event according to the changing needs and obsessions of each new ear…” It is doubtlessly well-written, even elegant, so will appeal to many who like good, semi-scholarly and insightful work. 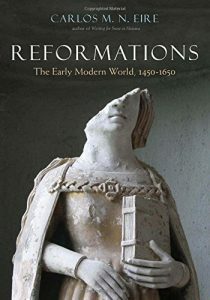 Another reviewer has called it “fascinating, lucid, and perceptive” and noted that it is less about the reformation as such as, in fact, exactly what the title says: it is about remembering. That is, it is a study and telling of how this event – from 1617 (100 years after Martin did his thing at Wittenberg) onward – has been commemorated. In this sense, it not only sees how the reformation has been understood and received and taught, but could more generally “prompt us to reflect on the ethical and interpretative issues at stake in commemorating [other] major religious events.” Pretty cool, eh? 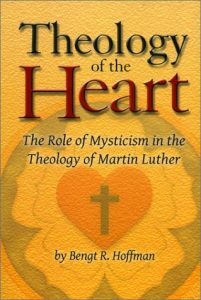 Theology of the Heart: The Role of Mysticism in the Theology of Martin Luther Bengt R. Hoffman (Kirk House Publishers) $26.00 This is a rare but important book and we hare happy to stock it. We met the author decades ago when he was a professor of ethics and ecumenics at Gettysburg Lutheran Theological Seminary. 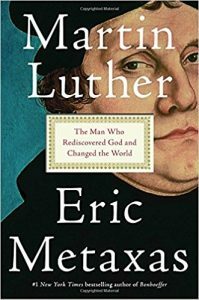 It should be clear that Luther was influenced in some way by the famous Rhineland mystics and that there are key writers, preachers, contemplatives and mystics who shaped Luther’s deepest spirituality. The author of this remarkable work was himself “a man of the heart” as one of his friends put it and it compelled him to do this unusual study of the spiritual experiences that shaped the piety of our brave outspoken monk. 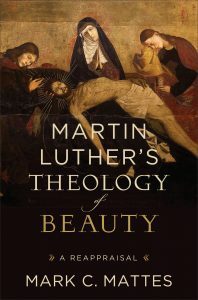 Martin Luther’s Theology of Beauty: A Reappraisal Mark C. Mattes (Baker Academic) $35.00 Special kudos to Baker Academic for giving us a number of thoughtful and classy new volumes to add to the growing list of important new reformation-ear studies. This one is what Donald McKim calls “intriguing and richly textured” and it relates not only the standard insights about Luther’s view of the crucified Christ but about the very “gospel beauty” that shines through. It is not a stretch, as far as I can tell, but few have mined Luther’s thought as a source for aesthetic reflection. Granted, Luther despised the fancy “theologies of glory” but even in his understanding of suffer, Mattes shows, there is beauty. Luther had a richly developed aesthetic and as Gerald McDermott writes, it is “clear and learned, this book draws connections that will surprise many.” You heard about it here! By the way, if this interests you, don’t forget that I highlighted not long ago a very important new book by David O. Taylor called The Theater of God’s Glory: Calvin, Creation, and the Liturgical Arts (Eerdmans; $30.00.) It is itself splendid and very important. We’ve got plenty on hand here. 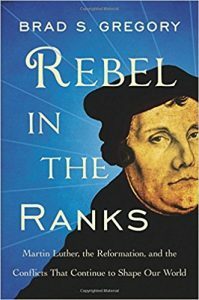 Rebel in the Ranks: Martin Luther, the Reformation, and the Conflicts That Continue to Shape Our World Brad S. Gregory (HarperOne) $27.99 This is considered a major contribution by a Catholic scholar, an authoritative account and a “profound examination of how both the man and the movement continue to shape the world today.” I suspect he says mostly for the worst. Professor Gregory (he teaches European history at the University of Notre Dame) wrote a major, much-discussed volume called The Unintended Reformation: How a Religious Revolution Secularized Society (Harvard University Press; $22.95) which is very well worth working through. 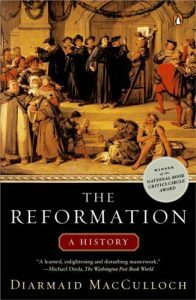 This is just the book for understanding the momentous changes initiated by the Protestant Reformation five hundred years ago. 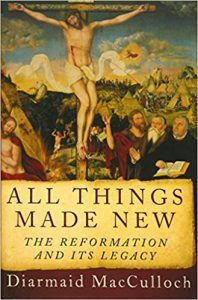 Brad Gregory expertly describes both the significance of Martin Luther (as the first protestant) and the tremendous impact of the Reformation era on everything that has followed. 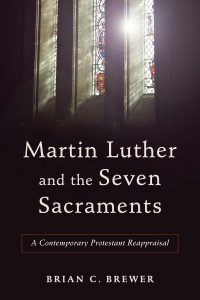 Martin Luther and the Seven Sacraments: A Contemporary Protestant Reappraisal Brian C. Brewer (Baker Academic) $26.99 Wow, this could be really helpful for some budding theologians or anyone interested in ecumenical discourse. Brewer has a PhD from Drew (which is United Methodist, largely) and is a professor at Truett Theological Seminary, which is Baptist. This is considered by some a very fresh and important exploration of Luther’s sacramental theology and how many conservative heirs of the Reformation have lost the profound sense of rituals and beauty and liturgy. Brewer is very Protestant but offers a great appreciation for Luther’s Christian practices as learned from the Catholic church. Brewer explores how, as R. Ward Holder at Saint Anselm College puts it, “the modern church is impoverished by the loss of its own rich heritage, and he proposes doctrinally and pastorally sensitive roads to recovery of that treasure. 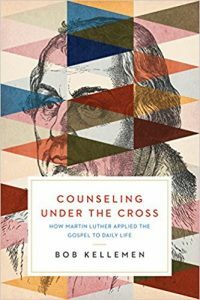 Counseling Under the Cross by Bob Kellemen is Martin Luther expertly assembled so we witness how the cross of Christ yields honesty, transparency, compassion, comfort, wisdom – full on humanity. In wonderfully accessible form, it is as if Luther were speaking to us at his table or writing to us the most personal of letters. And we, in turn, can’t wait to speak of such matters to those we love! It details the events and ideas of the sixteenth century and contends that the Protestant Reformation must be seen as an interplay of religious, political, and economic forces in which religion played a major role. 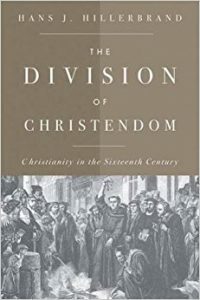 Hillerbrand tells the fascinating story of the ways in which theological disagreements divided the centuries-old Christian church and the roles that leading characters such as Luther, Zwingli, Anabaptists, and Calvin played in establishing new churches, even as Roman Catholicism continued to develop in its own ways. The book covers all significant aspects of this period and interprets these important events in their own context while reflecting on the consequences of the Reformation for later periods and for today. 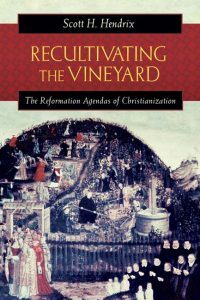 Recultivating the Vineyard: The Reformation Agendas of Christianization Scott Hendrix (Westminster/John Knox) $30.00 Here is what one scholar said about this: “Hendrix argues that 16th century reformers all had the same goal in Christianizing Christendom, that is, to replant authentic Christianity in the vineyard of the Lord. He believes it is more acute and useful to speak of one Reformation and to locate its diversity in the various theological and practical agendas that were developed to realizing the goal of Christianization.” It appears on many of the best reformation-era bibliographies and is considered very important. 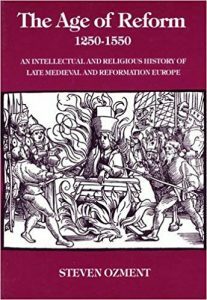 The Age of Reform, 1250-1550: An Intellectual and Religious History of Late Medieval and Reformation Europe Steven T. Ozment (Yale University Press) $29.99 This 1981 text is fairly new to me but a scholar I trust says it is the best historical study of the reformation-era ever. Ozment apparantly was exceptionally well-regarded as scholar and teacher of the high Middle Ages and he seems to have great sympathies for the reformation project. Reviews from both historians and theologians have repeatedly called it masterful and stimulating and clear and essential and the like. We started to stock it because of these notable recommendations. 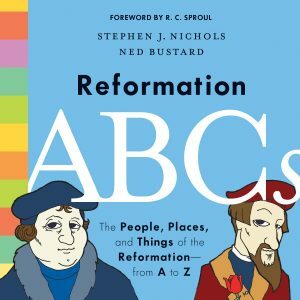 Reformation ABCs: The People, Places, and Things of the Reformation—From A to Z Stephen J. Nichols and Ned Bustard (Crossway) $16.99 This brightly colored book with zippy illustration by our friend Ned Bustard is just a blast; it has great information, great art, lots of color, lots of fun. We really hope you can find an excuse to get it for some young one in your circles. Or, of course, just for yourself. This dynamic duo brought us the slightly oversized kids book Church History ABCs and this is like that, but smaller. Wow, it so good it could be used with older kids or even adults, as long as the ABC approach doesn’t turn people off. It shouldn’t for adults who can use it playfully, but teens might think it is for kiddies. But they would be wrong; it has value for older youth, too. There is absolutely nothing like it in print. The historical material is strong and solid and reliable even if the artwork is sly and whimsical. 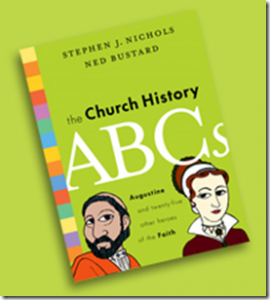 I am sure you’ll learn something new from Reformation ABCs and I’m sure you’ll smile a bit (maybe a lot, even, if you have a sense of humor as Luther certainly did.) Why not buy a few to give away – you’ll be glad you did if you help spread the message of the reformation to little ones everywhere. The Life and Times of Martin Luther Meike Roth-Beck, illustrated by Klaus Ensikatg (Eerdmans) $18.00 Wow, this is one of the most well-designed and beautiful children’s non-fiction books I’ve seen and really is worth looking at. It is a very well done picture book for somewhat older kids as it has a large amount of detail and important text (the publisher calls it “sophisticated” which it is.) Even though it is done in soft pastels and careful illustrations, it has notable strength of purpose to it. Ensikatg is one of Germany’s most beloved illustrators. His artwork has earned him several awards, including the Hans Christian Andersen Award, which commemorates his lifetime achievements. Indeed, this is a book to study and to keep. Very highly recommended. 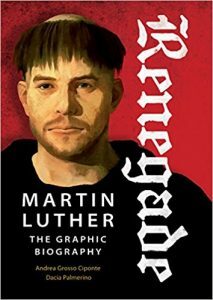 Renegade: Martin Luther: The Graphic Biography Andrea Grosso Ciponte and Dacia Palmerino (Plough Publishing) $19.99 Oh my, this is something; truly. It is hard to describe, as it is so raw and powerful, dark and gripping. Most is very realistic although there is a small touch of surrealism (such as in the frontispiece and the back cover.) Renegade is an oversized graphic novel which makes much of the dark times in which the Reformation began. There was the Black Death, gross poverty, and much ugliness; there were inquisitions and vicious violence against religious dissidents, there was vile warfare between regions (motivated by religion – ugh.) This excellently produced, oversized graphic novel (printed on heavy stock glossy paper as you would expect) will captivate older teens and young adults who read that sort of book, although it is intense. The design team of Ciponte and Palmerino are award-winning artists who live in Italy and have told the story of this brave God-soaked reformer who discovered beauty and goodness and God’s saving grace amidst much turmoil. Very well done. 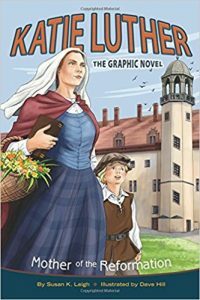 By the way, we have more modestly conceived, conventional comic book/graphic novel versions of the lives of both Martin Luther and Katie Luther that are themselves very nicely done. 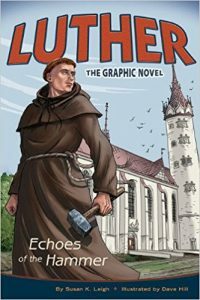 See Luther: Echoes of the Hammer by Susan K. Leigh and Dave Hill (Concordia; $13.99) which is 144 pages and Katie Luther: Mother of the Reformation, also by Susan Leigh and Dave Hill (Concordia; $12.99) which is a full 96 pages. These are great. 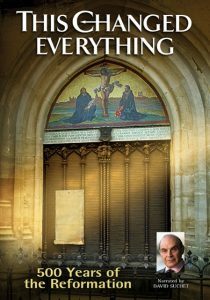 DVD This Changed Everything: 500 Years of Reformation with David Suchet (Vision Video) $39.99 Here is a DVD curriculum I’ve mentioned and want to commend it to you. I like its tone and approach — it is a vivid documentary of the Reformation, but it does include ecumenical voices (that is, Catholic, Orthodox and Protestant) and it feels acutely that having such deep divisions within the church is not as it should be. It is a two-disc set, with three hours of content, but you could obviously break it into smaller portions to watch if you want to use it in a class or group. While celebrating the fruits of the Reformation, this visually rich documentary also explores difficult questions about the schism. Could division have been avoided? Is there hope for reunification? In this fascinating 3-part series narrated by David Suchet, leading experts share their insights and pose vital questions about unity, truth, and the future of the church.